‘Stair 2’ is being demolished this summer to make way for new, bigger lifts (which will accommodate bigger wheelchairs) and a new staircase. Refurbishment work in and around the Library Building continues over the summer vacation. 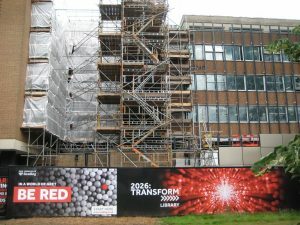 One of the main tasks being carried out over the next few weeks is the demolition of ‘stair 2’ – the staircase behind hoardings on the right-hand side of the building as you walk into the Library through the front entrance, adjacent to the male toilets (south side of the building). The demolition will be carried out in progressive phases, moving from top to bottom of the structure. Noise levels are likely to be high, depending on the works being carried out. The bulk of the noisiest demolition works are planned to be carried out before the start of the new academic term. You can find details of study space across campus on the Library refurbishment project page. This includes around 800 spaces in the URS Building and more in other campus rooms which you can find through the Free Room Finder. A banner on hoarding around where new lifts are being created. Demolition should occur over the summer vacation. 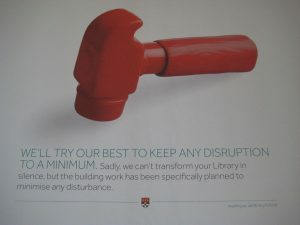 Keep checking the Library blog for the latest refurbishment news and updates. Details of the Library facilities available in URS (including services, map and opening times) can be found on our dedicated URS Building page. All of the above can be easily accessed through our Library refurbishment project page: www.reading.ac.uk/library/refurb.